Nanoscale Science and Technology is a new, graduate level interdisciplinary textbook which has just been published by Wiley. It’s based on the Masters Course in Nanoscale Science and Technology that we run jointly between the Universities of Leeds and Sheffield. 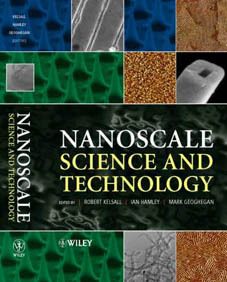 The book covers most aspects of modern nanoscale science and technology. It ranges from “hard” nanotechnologies, like the semiconductor nanotechnologies that underly applications like quantum dot lasers, and applications of nanomagnetism like giant magnetoresistance read-heads, via semiconducting polymers and molecular electronics, through to “soft” nanotechnologies such as self-assembling systems and bio-nanotechnology. I co-wrote a couple of chapters, but the heaviest work was done by my colleagues Mark Geoghegan, at Sheffield, and Ian Hamley and Rob Kelsall at Leeds, who, as editors, have done a great job of knitting together the contributions of a number of authors with different backgrounds to make a coherent whole.